In this study, Gram-positive bacilli (GPB) were identified by MALDI-TOF MS and analyzed according to the quaternary and microbial strains in the blood culture medium over a two year period at a university hospital. The results were as follows. The overall positive rate of blood culture was 9.97%. In 713 isolated GPB, 410 strains (57.5%) were identified using a microflex MALDI Biotyper. The positive rate of GPB among the blood culture positive bacteria was 8.2%, and the quarterly isolation rate was 9.8% in the third quarter of 2015, 8.7% in the second quarter of 2016, 8.1% in the third quarter of 2016, 8.1% in the first quarter of 2015, 7.9% in the first quarter of 2015, 7.9% in the second quarter of 2015, 6.8% in the first quarter of 2016, and 6.7% in the fourth quarter of 2015. The isolates were Corynebacterium striatum 89 (12.4%), Bacillus cereus 60 (8.4%), Bacillus subtilis 30 (4.2%), Paenibacillus urinalis 29 (4.1%), and Listeria monocytogenes 25 (3.5%). The results of 16S rRNA sequencing of 43 isolates (86.0%) were consistent with those of the other 50 isolates. Five out of the seven unmatched weeks were not identified by MALDI-TOF MS.
임상미생물검사실에서 분리되는 그람양성 막대균(Gram-positive bacilli, GPB)의 대부분은 환경에 존재하며 비병원성으로 알려져 있어, 그 동안 임상미생물 검사실에서는 오염균으로 간주하여 정확한 동정을 시행하지 않는 것이 일반적이었다. 그러나 GPB 중 몇몇 병원성 균종들은 임상적으로 중요하며, 최근 면역저하 환자나 체내 삽입기구 처치를 하는 환자가 증가하고 항생제 사용도 증가함에 따라 GPB에 의한 기회감염이 증가하고 있다. 따라서 GPB의 신속하고 정확한 동정의 필요성이 대두되었고, 정확한 GPB의 동정은 감염의 정확한 진단과 적절한 치료에 큰 도움을 주기 때문에 매우 중요하다고 볼 수 있다. 일반적으로 혈액배양에서 분리되는 GPB들은 비용의 효율적인 측면에서 동일 환자에서 2회 이상 분리되는 경우에만 감염의 의미를 가지고 동정을 시행하지만, 임상미생물 검사실에서 시행하고 있는 전통적인 동정방법으로는 동정 시간이 많이 걸리고 항상 정확한 결과를 얻기가 어렵다. 특히 패혈증의 경우는 미생물에 감염되어 일어나는 전신성 반응으로 사망률 또한 높은 질환이며 경제적 부담을 증가시킨다. 중환자실 환자의 경우 패혈증으로 인한 중증 패혈증으로 20∼50%의 사망률을 나타내며, 패혈성 쇼크 환자는 다른 질환에 비해 사망률이 각각 30∼87%에 이를 정도로 심각한 질환으로 많은 경제적 부담을 증가시키므로 패혈증의 원인균을 신속하게 진단하고 치료의 방향을 신속하게 제시해 줌으로써 환자의 예후에 큰 영향을 미칠 수 있다. 따라서 임상 미생물 검사실에서는 저렴한 비용으로 좀 더 신속하게 원인균을 동정해 내고자 노력하고 있다. 그러나 일반적으로 행해지고 있는 생화학적 동정방법으로는 최소 2일 최대 4일 정도의 시간이 소요된다. 최근 개발된 microflex MALDI Biotyper (Bruker Daltonik GmbH, Bremen, Germany)는 MALDI-TOF MS 기법을 이용하여 얻은 세균의 단백질 정보를 이미 구축된 각 균종에 대한 정보와 비교 분석하여 균종을 동정하는 원리를 이용한다. Seng 등의 연구에 의하면 MALDI-TOF MS 동정 시간은 균주 당 평균 6분 정도 소요되며, 동정을 위해 산출되는 비용은 상품화 키트를 포함한 전통적 동정방법의 22∼32%로 임상 미생물 검사실에서 이용하기에 간편하고 동정에 소요되는 것으로 보고하였다[7, 8]. 혈액배양 시료에서 직접 세균 동정과 항생제 감수성 시험실시하는 방법은 정확하고 결과를 보고하는데 까지 소요 되는 시간을 크게 감소시켜 효율적인 치료에 유용하게 활용될 수 있다. 대부분의 MALDI-TOF MS 장비를 이용한 연구에서는 임상미생물 검사실에서 주로 동정이 되는 그람양성 알균, 그람음성 막대균 및 매우 소수의 GPB을 포함하여 동정하고 있다[10, 11]. 그러나 국내에서는 MALDI-TOF MS를 이용한 혈액배양에서 GPB분리 동정률에 대한 자료가 부족하여, 본 연구에서는 일개 대학병원의 혈액배양에서 분리된 전체 세균을 대상으로 MALDI-TOF MS를 이용하여 GPB의 균종별, 분기별 분리 비율을 조사하여 혈액배양에서 전통적 방법으로 동정되지 못하거나 오염균으로 간과 할 수 있는 오류를 최소화 하기 위한 기초자료를 알아보고자 하였다. 2014년 10월부터 2016년 9월까지 2년간 일개 대학병원 임상미생물 검사실로 혈액 배양이 의뢰된 87,241건 중에서 GPB로 분리된 713균주를 대상으로 하였으며, 분기별 혈액배양 양성률 중 GPB의 분리율을 분석하였다. 혈액배양은 산소성 배지인(BacT/ALERT FA Plus, FA)와 BACTEC ™ Plus Anerobic/F), 무산소성 배지인(BacT/ALERT Standard Anaerobic, SN)와 (BACTEC™ Plus Anerobic/F)에 각각 5 mL 씩 접종하였으며, 각각 BacT/ALERT 3D blood culture system (bioMérieux Inc., Durham, NC, USA)과 BD BACTEC™ FX blood culture system (BD, Spark, MD)에서 5일간 배양하였다. 혈액배양 양성 배양액을 5% sheep blood agar plate (Hanil Komed)에 접종하여 5% CO2, 35°C 배양기에서 24시간에서 48시간 동안 배양하였다. 분리된 균종들은 집락 성상과 그람염색 결과를 이용하여 GPB로 일차 분류하였다. 전통적 혈액배양에서 양성인 배양액을 혈액우무배지에 배양한 후 집락 성상과 그람염색 결과 GPB로 확인된 균주를 대상으로 microflex MALDI Biotyper (Bruker Daltonik GmbH, Bremen, Germany)로 검사하고 MALDI Biotyper RTC software (V. 3.1)을 이용하여 직접 도말법으로 균종을 동정하였다. 직접 도말법은 하룻밤 배양한 신선한 집락을 멸균 Wooden applicator 를 이용해 MSP 96 target polished steel BC microscout Target plate (Bruker Daltonics)에 도말하고, 세균이 마른 후 매트릭스 용액(50% acetonitrile, 2.5% trifluoroacetic acid)에 포화 된(α-cyano-4-hydroxycinnamic acid)을 더한 시약 1 μL를 가하고, 실온에서 완전히 건조시킨 후 microflex MALDI Biotyper 장비에 장착하였다. Bacterial test standard (BTS)를 사용하여 장비 Calibration을 실시하였고, m/z 2,000∼20,000 범위에서 측정된 Mass spectra 동정 결과는 MALDI Bio- typer RTC software (V. 3.1)를 이용해 분석하였다. 동정은 기기 회사의 기준을 이용하여 판정하였는데, 일반적으로 동정치(cut-off score)가 2.0 이상이면 균종 동정이, 1.7 이상이면서 2.0 미만인 경우 균속 동정이 가능한 것으로 판단하였고 1.7 미만인 경우 신뢰성이 없는 것으로 조작적 정의를 하였다. 2014년 10월부터 2016년 9월까지 2년간 혈액배양에서 의뢰 건수 총 87,241건 중 전체 양성은 8,699건으로 9.97%를 나타내었고, 그 중 Gram positive cocci는 4,198건(48.3%), Gram negative bacilli 3,245건(37.3%), GPB 713건(8.2%), Candida species는 513건(5.9%), Gram negative cocci 30건(0.3%) 순으로 분리되었다. 2014년 4분기 의뢰 건수 총 10,168건 중 전체 양성률은 1,028건으로 10.1%를 나타내었고, 그 중 Gram positive cocci는 562건(54.7%), Gram negative bacilli 343건(33.4%), GPB 83건(8.1%), Candida species 38건(3.7%), Gram negative cocci 2건(0.2%)를 나타냈으며, 2015년 1분기는 의뢰 건수 총 9,732건 중 전체 양성률은 861건으로 8.8%를 나타내었고, 그 중 Gram positive cocci 457건(55.2%), Gram negative bacilli 266건(30.9%), GPB 68건(7.9%), Candida species 46건(5.3%), Gram negative cocci 6건(0.7)%를 나타냈으며, 2015년 2분기 총 9,574건 중 양성은 998건(10.4%)을 나타내었고, 그 중 Gram positive cocci 517건(51.8%), Gram negative bacilli 339건(34.1%), GPB 83건(7.9%), Candida species 52건(5.2%), Gram negative cocci 7건(0.7%)를 나타냈다. 2015년 3분기 총 의뢰 건수 11,255건 중 양성은 1,263건으로 1.2%를 나타냈으며, 그 중 Gram positive cocci 572건(45.3%), Gram negative bacilli 481건(38.1%), GPB 124건(9.8%), Candida species 81건(6.4%), Gram negative cocci 5건(0.4%)를 나타냈다. 2015년 4분기 총 11,163건 중 양성은 1139건(10.2%)이었으며, 그 중 Gram positive cocci 508건(44.6%), Gram negative bacilli 412건(36.2%), Candida species 131건(11.5%), GPB 84건(6.7%), Gram negative cocci 4건(004%)의 순으로 나타났다. 2016년 1분기는 총 11,321건중 양성은 950건(8.4%)이었으며, 그 중Gram positive cocci 415건(43.7%), Gram negative bacilli 409건(43.1%), GPB 65건(6.8%), Candida species 57건(6.6%), Gram negative cocci 4건(0.4%)을 나타냈다. 2016년 2분기 총 의뢰 건수 11,937건 중 양성은 1212건(10.2%)이었으며, 그 중 Gram positive cocci 537건(43.3%), Gram negative bacilli 507건(41.8%), GPB 105건(8.1%), Candida species 62건(5.1%), Gram negative cocci 1건(0.01%)로 나타났으며, 2016년 3분기 총 의뢰 건 수 12,091건 중 양성은 1,248주(10.3%)이었으며, 그 중 Gram positive cocci 612건(49.0%), Gram negative bacilli 488건(39.1%), GPB 101건(8.1%), Candida species 46건(3.7%), Gram negative cocci 1건(0.01%) 순으로 분리되었다. 총 혈액배양 양성률은 10.0%였으며 양성세균 중 GPB양성률은 8.2%였다(Table 1, Figure 1). Abbreviations: No, number; Q, quarter. 1st quarter: Jan to Mar, 2nd quarter: Apr to Jun, 3rd quarter: Jul to Sep, 4th quarter: Oct to Dec.
Quarterly in year positive blood cultures at one university hospital (2014∼2016). 총 713건의 GPB를 microflex MALDI Biotyper를 이용해 동정하여 기기 회사의 기준에 따라 균속 동정이 가능한 스코어 1.7 이상 균주는 410주 57.5%였다. 동정은 되었으나 스코어 1.7 아래로 신뢰할 수 없는 결과를 보였던 균주는 213주 29.9%였고 no peaks found로 동정이 안되는 균주는 90주 12.6%였다. 스코어 1.7 이상에서 동정된 균주별 분리는 Corynebacterium striatum 89건(12.4%), Bacillus cereus 60건(8.4%), Bacillus subtilis 30건(4.2%), Paenibacillus urinalis 29건(4.1%), Listeria monocytogenes 25건(3.5%), Clostridium perfringens 18건(2.5%), Bacillus licheniformis 16건(2.2%), Bacillus pumilus 12건(1.7%)이었으며, Bacillus mojavensis, Corynebacterium afermentans, Bacillus sonorensis 각각 10건(1.4%)이었고, Microbacterium spp. 8건(1.1%), Bacillus megaterium 7건(1.0%)순으로 나타났다(Table 2). ID result cut-off criteria: score ≥1.7. Microbacterium aurum, Lysinibacillus fusiformis, Solibacillus silvestis, Paenibacillus illinoisensis. Bacillus atrophaeus, Bacillus circulans, Bacillus flexus, Bacillus muralis, Bacillus niacini, Bacillus thermoamylovorans, Bacillus weienstephanensis, Clostridium bifermentans, Clostridium innocuum, Corynebacterium amycolatum, Corynebacterium falsenii, Corynebacterium pseudodiphthriticum, Corynebacterium singulare, Corynebacterium tuscaniense, Dermabacter hominis, Exigubacterium aurantiacum, Gordona rubropertincta, Lactobaillus salivarius, Microbacterium oxydans, Microbacterium testaceum, Paenibacillus barengoltzii, Paenibacillus latus, Paenibacillus rhizosphaerae, Paenibacillus odorifer, Paenibacillus pauli, Paenibaillus xylanilyticus. 염기서열 분석을 위한 PCR을 수행하기 위해 Forward primer인 16S-rRNA1 (5’-AGT TTG ATC CTG GCT CAG-3’)와 Reverse primer인 16S-rRNA2 (5’-GGT TAC CTT GTT ACG ACT T-3’)를 이용하였다. Primer 각각 20 pmol 1 μL, dNTPs 1 μL, 10x Reaction buffer (1x: 10 mM Tris-HCL, 1.5 mM KCL, 0.1% Triton X-100) 5 μL, 2.5 U/μL DyNAzymeTM polymerase 1 μL, 멸균 DW 38.5 μL에 추출 된 gDNA 2.5 μL를 넣어 총 50 μL로 반응액을 만들었다. PCR은 TaKaRa PCR Thermal cycler (TP600 Gradient, Roche Molecular System, CA, USA)를 사용하였고, 온도 조건을 94°C에서 5분 predenaturation시킨 후, 94°C 에서 1분 dena- turation, 49°C에서 1분 annealing, 72°C 에서 1분 extension을 1주기로 36회 실시하여 증폭하고 72°C 에서 10분간 postextension 을 실시하였다. microflex MALDI Biotyper의 동정 결과와 생화학적 동정 결과와 일치하지 않는 총 50주 중 43주는 16S-rRNA sequencing 분석 결과와 일치하였으나 7주는 일치하지 않았다. 일치된 균주들은 Corynebacterium striatum 19주, Clostridium perfringens 5주, Listeria monocytogenes 9주, Bacillus iodinum 1주, Clostridium canis 1주, Corynebacterium urealyticum 1주, Mycobacterium abscessus 1주, Paenibacillus urinalis 1주 이었다. 1.7 이상의 스코어에서 동정되었던 균주 중 Bacillus cereus는 Lysinbacillus spp.로 Microbacterium spp.는 Mycobacterium paraoxydans로 각각 16S-rRNA sequencing 결과와 불일치하였고, 5주는 MALDI-TOF MS에서도 not reliable identification 혹은 no peaks found를 나타내 동정해내지 못했던 균주들에 대한 16S-rRNA sequencing 분석 결과 Cellulomonas hominis, Corynebacterium amycdatum, Catabacter hongkongenesis, Bacillus spp., Bacillus velezensis로 동정되었다(Table 3). Bacillus cereus 5 1 Lysinbacillus sp. 혈액배양 양성은 세균성 균혈증을 나타낼 수 있는 것으로 생각할 수 있지만 일부는 오염에 의한 혈액배양 양성이 존재할 수 있기 때문에 모두가 진정한 감염을 나타내지 않는다. 혈액배양에서 분리되는 많은 GPB의 대부분은 정상적인 피부 정상상재균의 일부로 혈액배양을 오염 시키거나 정맥내 카테터에 집락화 될 수 있다. 혈액배양에서 오염의 주된 원인균으로는 Propionibacterium acnes, Corynebacterium spp. 및 Bacillus spp.가 대표적이다. 그러나 노령인구의 증가와 면역기능 저하 환자의 증가, 장기 이식의 발전과 항암제, 방사선 치료 등으로 과거에 비병원성으로 생각하였던 균종에 의해서도 기회감염및 중증의 균혈증이 생길수 있음이 보고 되었으며, 실제로 이러한 세균들은 심내막염, 인공 심장 판막, 관절 감염, 호중구 감소증 등과 같은 특정 임상 조건의 맥락에서 병원성 일 수 있음을 기억해야한다. 국내의 한 연구에서도 혈액배양 오염균의 가능성이 높은 피부상재균으로 분류되는 Coagulase-negative Staphylococcus (CoNS), Bacillus spp., Corynebacterium spp., Enterococcus spp., Micrococcus spp., Propionibacterium spp.이 혈액배양에서 동정되면 임상적인 의미의 해석 없이 모두 분석에 포함하여 연구하였다는 GPB의 분리 동정에 대한 제한점에 대해 보고한 바 있다. 이러한 제한점이 있음에도 불구하고 임상검사실에서는 확실한 오염이라고 판단되지 않는 한 일단 양성 세균의 분리 결과를 보고하고, 그 결과에 대해서는 임상의의 판단에 맡기는 경우가 많다. 국내외 많은 연구에서는 GPB을 포함한 혈액배양에서 분리되는 미생물들에 대해서 균혈증과 관련된 높은 이환율과 사망률 때문에 신속한 평가와 적절한 경험적 항생제 치료가 매우 중요하다고 강조하고 있다. 혈액배양에서 세균 검출을 위한 분자 진단 기술이 보다 쉽게 이용 가능하고 구현하기가 용이해질 때까지 임상의는 경험적 치료 결정을 내리는 데 필요한 예비 자료로 그람 염색법을 계속 의존해야 한다. 실제적으로 MALDI-TOF MS 기술이 도입되기 전까지는 혈액배양에서뿐만 아니라 임상 검체에서도 GPB의 분리율이 낮을 뿐만 아니라 분리되는 종(species)의 수도 극히 제한되는 경우가 많았다. 하지만 상대적으로 오염균으로 간주되어지던 GPB에 대한 국내 연구는 많은 부족함을 느껴 본 연구를 통해 GPB의 분리율과 분리되는 종의 다양성에 대해 알아보았다. 본 연구에서는 일개 대학병원에서 2년간 의뢰된 총 87,241건 중 양성은 8,699건으로 전체 양성율은 9.97%였으며, 양성 세균 중 Gram positive cocci는 4,198건(48.3%), Gram negative bacilli 3,245건(37.3%), GPB 713건(8.2%), Candida species는 513건(5.9%), Gram negative cocci 30건(0.3%) 순으로 분리되었다. 이는 Ahn 등이 보고한, 2002년부터 2006년까지 혈액배양 양성율은 18.5%로 본 연구에서의 9.97% 보다 2배 가량 높은 비율의 양성율을 나타냈으며, Gram positive cocci의 분리율은 35.1%로 본 연구에서 48.3% 보다 낮게 나타났고, Gram negative bacilli는 23.9%로 본 연구에서의 37.3%로 본 연구보다 낮은 양상을 나타내었으며, GPB의 분리율은 5.2%를 나타내 본 연구에서의 8.2%보다는 낮은 분리율을 나타냈다. GPB의 5.2% 중 Bacillus spp. 0.8%, Erysiphelothrix spp. 0.2%, 기타 GPB의 분리율은 12.8%로 보고하였으며, Candida species는 2.8%, Gram negative cocci 0.0%로 본 연구에서의 0.3%와 약간의 차이가 있음을 보고하였다. 국내 다른 연구에서 1998년부터 2010년까지 13년간의 보고에 서는 전체 양성률에 대한 보고는 없었으나 Gram positive cocci의 분리율은 50.1%로 본 연구에서 48.3%, Gram negative bacilli는 38.4%로 본 연구에서의 37.3%로 본 연구에서 와 비슷한 양상을 나타내었으며, GPB는 무산소성 막대균을 포함하여 7.7%를 나타내 본 연구에서의 8.2%보다는 약간 낮은 분리율을 나타냈다. Yeasts는 2.8%로 본 연구에서 5.9% 보다 낮게 나타났다. 결론적으로 2년간 총 혈액배양 양성률은 평균 9.97%였으며 microflex MALDI Biotyper를 이용하여 총 713건의 GPB을 기기 제조회사의 기준에 따라 균속 동정이 가능한 스코어 1.7 이상 균주는 410주 57.5%이었다. 동정은 되었으나 스코어 1.7 아래로 신뢰할 수 없는 결과를 보였던 균주는 213주로 29.9%였으며 no peaks found로 동정조차 힘들었던 균주는 90주 12.6% 이었다. 혈액배양 양성세균 중 GPB의 양성률은 평균 8.2%였다. 분기별 분리율은 2015년 3분기는 9.8 %, 2016년 2분기는 8.7 %, 2016년 3분기는 8.1 %, 2014년 4분기는 8.1%, 2015년 1분기는 7.9 %, 2015년 2분기는 7.9 %, 2016년 1분기는 6.8 %, 2015년 4분기는 6.7 % 순으로 분리되었으며, 분기별 분리률의 차이는 유의성이 없는 것으로 나타났다. 분리 균종별로는 Corynebacterium striatum 89주 12.4%, Bacillus cereus 60주 8.4%, Bacillus subtilis 30주 4.2%, Paenibacillus urinalis 29주 4.1%, Listeria monocytogenes 25주 3.5% 순으로 분리되었다. Listeria spp. 등과 같은 임상적으로도 의의가 많은 감염균의 동정은 다른 연구에서와 비슷한 비율을 나타내었다[18-20]. 또한 분리 건수는 적지만 Mycobacterium spp., 각종 Corynebacterium spp., Bacillus spp., Clostridium spp.은 1.7 이상에서 신뢰할 수 있을 만한 스코어로 동정할 수 있었다. 물론 동정해내지 못하거나 신뢰할 수 없는 결과도 42.5%로 절반 정도를 차지하였다. 여러 개의 혈액배양병에서 1개에서만 양성으로 분리된 것은 거의 대부분이 오염균으로 간주되어 감염균으로의 의의가 없는 것이었다. 그러나 1개만 분리되었어도 감염의 의의가 있는 Listeria monocytogenes는 25주가 분리되었다. 최근 우리나라에 공급되기 시작한 MALDI-TOF MS 기술은 임상미생물검사실에서 세균과 진균을 동정함에 있어 효과적인 방법으로 인식되고 있고, 사용 또한 늘어나고 있다. 많은 논문에서 임상적으로 의의가 있는 그람양성 알균과 그람음성 막대균, 진균의 대부분이 MALDI-TOF MS를 통해 속수준까지 간편하고 신속하게 동정 가능하다는 것을 보고했다. 본 연구에서는 2년간의 혈액배양에서 분리된 GPB의 절반 이상을 1.7 이상의 스코어에서 신뢰할 수 있을 만한 종(species) 수준까지 다양한 균종의 동정이 가능하다는 것을 확인하였다. 우리의 경험에 의하면 임상미생물검사실에서 분리된 GPB을 MALDI-TOF MS 기술을 사용하여 1차 동정해 보고 의의가 있는 균주에 대해서는 이를 확인하는 전통적 방법이나 16S-rRNA sequencing 방법을 적용하여 판독한다면 향후 감염균으로서 의의가 있는 GPB의 동정에 매우 유용하리라 판단된다. 제한점으로는 흔히 분리되지 않고 비병원성 오염세균이 많이 포함될 수 있는 GPB의 특성으로 인하여 데이터베이스가 부족하고, 협막이 있는 일부 GPB의 구조적 특성상 단백질 분리의 어려움이 있어 동정해 내지 못하는 제한점이 있다. 앞으로 데이터베이스를 더 확충하고, 단백질 분리가 어려운 GPB의 경우 다른 분리 방법을 추가하여 동정한다면 정확한 동정에 더 많은 도움이 되리라 생각된다. 본 연구에서는 일개 대학병원에서 2년간 분리된 혈액배양 양성배지에서 MALDI-TOF MS system을 이용하여 Gram- positive bacilli를 동정한 결과를 균종별, 분기별로 분석하였다. Corynebacterium striatum은 총 89균주 중 66균주 (74.2%), Bacillus cereus는 60균주 중 44 균주 (73.3%), Listeria monocytogenes는 25균주 중 25균주 (100%)로 2.0 이상의 높은 스코어에서 동정되었다. 미 동정 된 균주는 303균주 중 293균주는 혈액배양에서 1회 분리 균주로 감염균으로서의 의의가 없는 오염 균주로 간주되었다. 감염균으로서 의의가 있는 동일 환자 2회 이상 분리 균주 대상 16S-rRNA sequencing 비교결과 총 50균주 중 43균주가 일치해 86.0% 동정이 가능하였다. 일치하지 않은 7균주 중 5균주는 MALDI-TOF MS로도 동정이 되지 않았다. 결론적으로 혈액배양에서 Gram-positive bacilli가 동정되는 경우, 일차적으로 MALDI-TOF MS를 이용하여 동정해보고 이를 활용한다면 어렵고 비용이 많이 들던 Gram-positive bacilli 동정이 저비용으로 더욱 간편하고 정확해지며, Gram- positive bacilli에 의한 감염 진단에도 도움이 될 것으로 판단된다. Choi JU1, M.T. ; Yu YB2, Professor; Kim SH3, M.T. ; Won S4, Professor; Kim YK2, Professor. Funke G, von Graevenitz A, Clarridge J3, and Berneard KA. Clinical microbiology of coryneform bacteria. Clin Microbiol Rev 1997;10:125-159. Ahn GY, Jang SJ, Lee SH, Jeong OY, Bidur Prasad Chaulagain BP, and Moon DS et al. Trends of the species and antimicrobial susceptibility of microorganisms isolated from blood cultures of patients. Korean J Clin Microbiol 2006;9:42-50. Shin KS, Son YI, Kim TD, Hong SB, Park JS, and Kim SH et al. 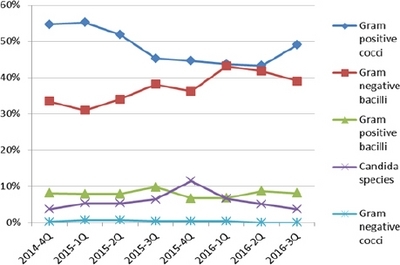 Secular trends of species and antimicrobial resistance of blood isolates in a tertiary medical center for ten years: 2003-2012. Biomedical Science Letters 2014;20:2288-7415.